As an advocate, it is easy to feel protective of the fragile movement for respectful, rights-based maternity care. There is a lot of criticism of that movement, and the majority of it is rooted in sexist, racist, and historically skewed treatment of midwives and women. But as a communications professional who very closely follows media around maternity care, I’ve realized something over time that conflicts with my own protective instincts around a movement I deeply support. That is: when it comes to the things that must change, the ways in which advocates and professionals fall short and can even perpetuate harm, these harms are only rooted out when they are aired out. It forces a reckoning. This kind of a reckoning–public and uninvited–is a difficult one, of course, because it does not come from a place of love and collaboration. Along those lines, this past weekend, an extraordinarily lengthy, in-depth investigative journalism piece examining the out-of-hospital (OOH) birth industry was published. The piece included numerous accounts that have surfaced over the years, as well as some previously unheard stories, of families whose babies died at or following an OOH birth. Many appear to have received poor care from their midwives and/or affiliated obstetrician. I was pleased that my dear friend and colleague Diana Snyder gave me permission to post her thoughts on that investigation here as the following article. After reading what she so brilliantly wrote, I knew I would not have written anything different and it’s past time we dive into these tough conversations. Diana and I have worked together closely over the years on many difficult issues in the world of birth advocacy and I value her perspective very much. I second her invitation to discuss how we, as advocates, can do our best to support all families and value accountability in every setting. A word about Diana: When Diana and I met at one of my workshops about legal rights in maternity care about six years ago, she was an associate at a top national law firm and interested in birth issues. In addition to her day job, she immediately joined our small, determined group of advocates to play a leading role helping young mother Kimberly Turbin bring a lawsuit for medical battery after a forced episiotomy. Among her other critical work on Kimberly’s case, Diana was the lawyer who contacted 80-some individuals and organizations to try to convince one of them to represent this woman–ultimately, successfully. Since then, she has moved to Boston to work at another top law firm and then left corporate practice altogether to establish Matrescence, a private doula service supporting women and families through birth and postpartum, and a parallel legal and patient advocacy practice dedicated to women’s rights in childbirth and the practice of midwifery. 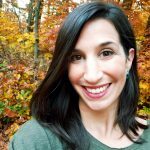 Diana serves as outside counsel to the Bay State Birth Coalition, a consumer organization advocating for legal recognition of certified professional midwives in Massachusetts. Today, she is a valued source of support to both her doula and legal clients, who range from women and families to midwives and other birth professionals. She now resides in Southeastern Massachusetts with her husband Mike, son Bennett and beloved vizsla, Rocky. As all my friends know, I am a strong OOH birth and midwifery supporter. As such I always approach negative media coverage with a very skeptical eye. Given the historical oppression/misunderstanding/oversimplification of OOH birth and midwifery by medical interests and society generally, such pieces are typically riddled with bias, lack necessary context & nuance, reference debunked studies and more. Its very frustrating. I am not going to go into detail about the ways in which this piece exhibits the usual deficiencies. That’s not the point of my post here. I read the piece in its entirety, with an open heart, and struggled with it all day yesterday. As an OOH birth/midwifery supporter, I feel a moral and ethical obligation not to dismiss every piece of negative coverage out-of-hand. I feel an obligation to sit with the hard issues, and acknowledge them in my community. What I wish to share is this. The problems with this piece do not discredit the fundamental issues raised: (1) while rare, loss absolutely happens in out-of-hospital birth. (2) sometimes, losses are the result of poor quality care and lack of true informed consent. (3) in such cases, accountability is elusive. These are facts, and I do not think we should hide from them or deflect attention from them by pointing back to how much negligence exists in hospitals, how these pieces are driven by anti-CPM propaganda, or how families traumatized in the hospital don’t get accountability, either. These things may be true, but families who have been traumatized by or suffered loss from their home birth experiences also deserve to be heard, if they want. In particular, they should be heard and validated and supported WITHIN the home birth community — not just by outside, anti-home birth interests because they have nowhere else to turn. In that vein, I find it especially concerning that some of the loss families featured in this article report being shunned and even blamed for their babies’ deaths by the birth community. One mother reported being “booed” by other home birth moms when she showed up to testify in court about the death of her baby. The article also quotes a midwife blaming a loss mom by alleging the raging infection that killed her baby was the result of the mother’s choice to labor in water — a near universal, safe practice/request at home births that midwives would vehemently deny is dangerous in other contexts. Even if blame is unjust, who boos a loss mom? Who suggests that the death of a baby is the mother’s own fault? These accounts are astonishing to me, and while they may not be representative, I think we should discuss them. At this juncture, I feel the need to point out that making loss families feel alone, blamed and unheard — even unintentionally — is exactly how pieces of this nature get traction, and how the “Skeptical OBs” of the world exploit the grief and isolation of these families to further an anti-home birth, anti-choice-for-women agenda. I do not want to minimize how terribly difficult it must be to have a conversation with a loss family about the cause of their baby’s death, and how sometimes, blame may occur even if unwarranted. It is natural for care providers to feel scared and defensive. Nonetheless, we must acknowledge that questions about care are legitimate and to be expected in the wake of loss. Suppressing them is extraordinarily unfair and damaging to the family, and increases legal and PR risk to the midwife. We cannot decry the anti-home birth movement and dismiss pieces fueled by it without examining the ways in which our own self-protective conduct may contribute to that sentiment. We must offer loss families a safe space within our community, first and foremost because it is the right thing to do, but also, because an ounce of prevention is worth a pound of cure when it comes to extreme narratives in the media, anti-choice and anti-midwife legislation, and anti-home birth sentiment. I will also comment on the notion of personal responsibility in home birth. I have written before about how taking responsibility, and accepting the outcomes for our decisions, are extremely important when planning a home birth. And I stand by that. But just because families take a higher level of responsibility when planning an OOH birth, certainly does not mean midwives are automatically absolved of responsibility. Midwives are trained professionals, with competencies, standards of care and ethical obligations. Every midwife I know takes their responsibility for practicing those things seriously. In order for a family to truly take “responsibility” for a poor outcome, there must have been informed consent not just about the original choice to plan a home birth, but at every decision point during the whole course of care, including labor. Home birth is not merely a one-time rejection of hospital care; it is ongoing collection of many complex decisions — an evolving assessment of whether home is still the safest, preferred place. Whenever changing circumstances, including during labor, warrant reexamining the decision to stay home, issues of informed consent, standard of care, gray area in recommendations/risk, and others are implicated. Midwives bear a heavy burden in terms of initiating these conversations for the client’s decision when appropriate, while not needlessly bringing distraction and fear to the laboring person. I don’t envy that. Because OOH birth is widely seen as a panacea to poor hospital care, it is understandable that sometimes, both consumers and midwives may be lulled into a low-key approach to these things. But clients cannot be expected to take responsibility for a poor outcome if they were not adequately informed of risks/benefits and given clear choices — including the option to transfer or stay the course — at key junctures on the path to loss of life. These are complex discussions beyond my experience — reasonable minds can disagree about what constitutes adequate information for informed consent on a particular issue and when exactly something reaches the point where it needs to be raised with the client prenatally or during labor. And there’s also always the issue that sometimes client and midwife accounts differ. But I have faith that the home birth community can reflect on whether current approaches to informed consent in the OOH setting actually allow parents to take responsibility for outcomes. I cannot imagine how difficult it must be to approach a conversation with a family when there is a dispute as to whether a bad outcome was avoidable and what the appropriate allocation of client vs. midwife “responsibility” is. And I don’t deny that sometimes, blame may be placed without cause. But loss families are entitled to explore these things with their midwife, with whom they have developed a close and trusting relationship, and who is often the only other person with firsthand knowledge about the death of their baby — something grieving families will naturally be desperate to dissect. They are also entitled to talk about their experience in the birth community that they have become a part of without being attacked and guilted into silence. I know that these conversations can be had, without ghosting or getting defensive, and certainly without resorting to blaming or smearing a loss family. I would welcome the chance to discuss how to do so with my friends who have a view on it. Many will be saying “NOT ALL MIDWIVES” — and I agree. I cannot see a single home birth midwife that I know acting the way described in that article, and yet, I still believe that it happens. I consider myself a believer of women’s lived experiences, and if I am that, then I will also make room for women who say that their home birth team caused harm, just the way I believe women who experience harm in the hospital. Just because it is rare, and because home birth is a vulnerable underdog that needs protecting in many ways, doesn’t mean we should sacrifice these families to protect a narrative of home birth as unassailable. They are not disposable. They are us. We need to have the hard conversations. All industries suffer from similar problems, and there is no shame in admitting it — especially because many of these issues are the predictable legacy of how oppressed and marginalized OOH birth/midwifery have been and a direct result of industry and consumer retaliation against hospital care. Admitting it is part of accountability and this can only make home birth stronger, in my opinion. Taking ownership of problems can distinguish the home birth community from hospital systems in a positive and meaningful way. So, I would like to call in my many friends who have had OOH births, support OOH births, and attend OOH births, to continue the conversation with me about how we can better support loss families, and support midwives in feeling secure enough to have hard conversations with loss families, so that they aren’t made to feel at fault, isolated and ostracized in their grief. The OOH community is built on the notion of supporting all women, holding space for birth trauma, and so forth. This must ESPECIALLY be the case for those whose birth stories are really hard to hear — the stories that are tempting to sweep under the rug and dismiss as the inevitable cost of all the other lovely home births and happy clients that are easier to lift up. Let’s also support midwives in talking with loss families, and in reflecting honestly on whether something could have been done differently. Throwing up walls, dismissing the family’s recollection of events, protecting the cause at all costs — this is conduct that I expect from hospitals, not from the OOH community. There will also be clients who decide to cut off communication with a willing midwife of their own volition, and who may turn anti-OOH birth no matter how thoughtfully the midwife approaches discourse. This cutting off of contact is tragic and painful for the midwife, who is also suffering. All of this suggests a lack of sufficient resources for navigating these heartbreaking situations. So let’s open it up and talk about it. How do we help these situations go better, while also acknowledging that it won’t always be as simple as kumbaya? Midwives are not equipped to shoulder the entire weight of their client’s grief, and also shouldn’t wear a target on their backs. But there must be a way to ease these conversations. What I absolutely love about OOH midwifery and supporters is that we are trying to be the change. I challenge us to also be the change on the issue of holding space for loss families or families who have questions about the care they received. It feels very vulnerable, yes — but Brene Brown style, we must be courageous enough to face and embrace these families, because they sure don’t get a choice about facing what happened to them every day. I don’t want to oversimplify, because these issues are not easy, but loss families are not always looking to demonize home birth or sue. Just like families traumatized in the hospital, they want to be seen. They have questions. They need to process their grief. They want someone to validate what they went through without gaslighting them or diminishing their pain. They need to explore whether mistakes were made — this is a natural part of grieving that will not always evolve into blame. Midwives and the birth community can take these questions on with grace and humility. I know it. For those in the birth community in contact with other parents facing OOH loss, it is not a betrayal to a deeply held commitment to OOH birth or midwifery to show loss families that you are not afraid of their story and want to hear what they have to say. Yes, it can be very uncomfortable, but what would it look like if home birth loss families could expect the OOH community to band together to support them? I think so much positive could come from that. To those who fear that making themselves available to loss families is like taking sides, which we are naturally afraid to do when we don’t have all the facts, I say that this is not a zero sum game. 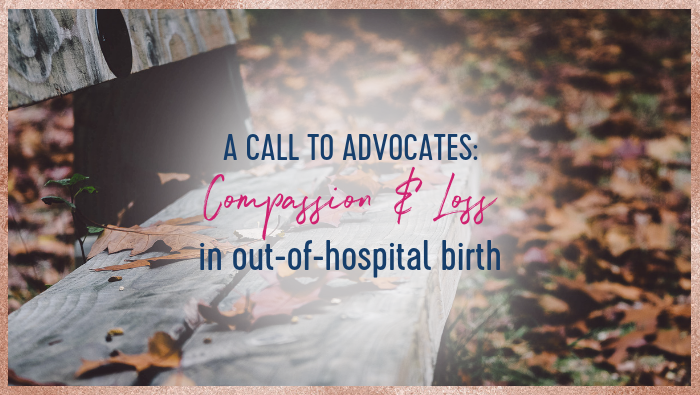 We can support OOH midwives and acknowledge that sometimes, loss happens, while also holding space for loss families and also acknowledging that poor practices exist, too. Just like we say about safety and the birthing person’s autonomy: these things are not mutually exclusive. We don’t have to choose one or the other. How would you wish to be treated if God forbid, the worst happened to you, and not only that, but everyone turned on you and blamed you? I believe if we support OOH birth, we should welcome these opportunities for growth. Because these issues are complex and nuanced, I certainly don’t know all the answers, but I look forward to continuing this conversation with you all. Please share your thoughts with me. Especially my midwife friends: What has your training been in talking with loss families? What resources do you wish you had? How can we support you in feeling supported too, in the event of a loss? What do you think the midwifery community needs around this issue? We welcome your constructive thoughts in the comment section below. I am a loss mom, and I am grateful for you reading the article and taking the time to think about the content. It disturbs me that you make an appeal to midwives specifically without, first, reaching out to loss moms, particularly because you pick up on the awful reality that we are not only frequently ignored, but frequently ostracized by the very community on which we had leaned prior to our bad experiences. I have been told I’m fear mongering more frequently than not when I shared in open internet fora in my initial efforts to advocate for the inherently high risk nature of home birth after cesarean. I’ve been told I just need counseling, that I just want to deprive other people of the experience I didn’t get to have, that I clearly had not “done my research”, that I must just not have been positive enough, done enough yoga, eaten the right things, drink raspberry leaf tea — all of the above (mostly explicitly, sometimes implicitly). What could my midwife have done? I signed an informed consent saying I wouldn’t sue if anything went wrong (my understanding now is that actually wouldn’t have flown in any legal case). She could have not blown off the second ultrasound I was supposed to have but skipped. She could have explained that not only were the risks of homebirth generally higher, the 1/200 risk of HBAC was that if I ruptured my baby would not survive. A 1 in 200 chance of my baby dying should have been the statistic I was given. Instead I was encouraged in my belief that the worst case scenario was a repeat csection. In the aftermath? She could have asked if I would like her to attend the memorial ceremony we’ve held annually ever since. She could not have canceled last minute every time she said she was coming out to see me. She could have offered to connect me with the other homebirth loss moms she knew — instead I tracked them down myself. I will always, ultimately, blame myself for my son’s death. But the isolation and the echo chambers that are created online where homebirth loss moms are silenced, over and over, is utterly unacceptable. It’s time for the homebirth community to be honest about the poor statistics on homebirth, to stop demonizing hospital birth, to encourage collaborative care and midwifery in a hospital setting, and to allow – even encourage – those of us with the saddest of stories to share them equally with the happy, homebirth stories that proliferate online. First, I am very sorry for your loss and the way you’ve been treated. I can’t even begin to imagine. I am the author and want to assure you that we have been in touch with a loss mom, who actually inspired the writing of this piece. Thank you for sharing some of the things that you wish you’d had from your midwife. This piece was focused on improving interactions with loss families generally, but I hope to put together a more detailed training for OOH midwives on, among other things, what loss families want from them (and informed consent as it relates to risk of OOH loss). Ideally this presentation would be co-designed and/or co-presented by a loss mom who is willing to take part. If you would be interested in having your comments here included, please feel free to contact me. I would absolutely want to center the voices of loss moms in such a training. If you contact Birth Monopoly directly, Cristen will give you my information. And if not, I totally get that. I believe in speaking your truth. Yet, so often we look down upon or exclude those who speak the uncomfortable truths. * I am a birth worker and a mother to 4 children (7 pregnancies total). I have had ideal birthing experiences and outcomes. One with midwives in the hospital and a fairly pleasant 24 hour stay postpartum (except for all the personal visitors– I felt loved, but it was lot). I then went on to have 3 home births. I am an advocate for ALL BIRTHS. I do believe the home birth experience is definitely authentic. With that being said, I informed myself, of all the possibilities and the “what if’s”. As a birth Doula, I convey to my clients about the “what if’s,” and different ways of how scenarios can play out. I provide as much information as is available so my clients can make FULLY informed decisions. I do believe when you make life altering decisions you should be 100% informed. You should ask as many questions as you need to and get all the facts in response. But, as much as this is the ideal, being provided all the facts doesn’t always happen. We so often put our trust in others to guide us and to not do us wrong. I would love to see 2019 be the year we all get to speak our truths AND be heard. Across the world and right here in our local birthing community. For certain stories to no longer be continuously swept under the rug because they don’t jive with certain “ideals” or birthing ethics. We as Doulas need to help our community with: informed decision making, transparency, advocacy and real, authentic sisterhood. So I’m going to share something, and I know I will get a lot of egos passing judgment. I’m okay with this: it’s in my wheelhouse. This is a call to advocacy! I am a proud doula, a certified bereavement doula. I am clearly not against out of hospital birth or midwifery. I had two beautiful homebirth experiences myself and am a huge supporter of a mother’s right to birth in any way she chooses. What I am against, is families being shamed, blamed, ostracized and shunned for their babies fatal birth outcomes in ANY setting. Families trust their care providers with thier lives and the lives of their babies, Most have little to no recourse in these instances where providers fail them. In homebirth outcomes when all is said and done they rarely have a community left to stand on or even to hear them out. Many of us only make space for the happy birth stories. The ones that fit our narrative. The stories that don’t make us cringe. The ones were proud of. The stories that don’t keep us up at night. We need to create a space and healing conversations for all loss families, regardless of how their loss occurred. As doulas we need to do better. It seems hippocritical to me to say we hold space for all mothers and then to not hear or make space for them because it’s uncomfortable or becomes an inconvenience. Here are my views regardless of how others may perceive them. How someone chooses to birth however low or high risk the pregnancy may be…..there are chances things can go wrong. Unless you are free birthing alone by choice or signing yourself out against medical advice…. I am assuming your care provider to be ultimately responsible to oversee and provide you with QUALITY care. I would tend to think this is even more important in an out of hospital setting. When things DO go terribly wrong, and mistakes are made, people need to step into a place of accountability. When this is avoided, trust crumbles. Grieving mothers being blamed for thier preapproved choices of where to labor? Mothers being blamed for not catching their own medical problems in active labor? One mother here being blamed for having a serious issue- that has a direct correlation with maternal infection, (this one resulted in the death of an otherwise healthy full term almost 10lb baby. Checking this mom IS a medical responsibility of her care providers to uphold. I am horrified by this report but mostly at how families who’ve had very negative OOH experiences are being GHOSTED by the “natural” birth community. My friends in particular have been shamed, publicly blamed, and blocked from local support groups just for sharing the story of the passing of their beloved baby. This is unacceptable. To embrace only the positive aspects of what you support, and hide anything negative, thats called bias. Why would we want to not tell women all of the facts? I believe it is a families’ right have access to this information so that everyone has the right to make fully informed choices. I hope you all make time to read this. I have been an advocate and doula for over a decade. I’ve attended hundreds of births (hospital and home) with a host of various midwives and physicians. I had my own two hospital births and one home birth. I absolutely agree that we need to have this conversation. I had the rare privilege of a CNM-attended home birth with the hospital where she had privileges half a mile away, with physician collaboration (in the same practice) and would have had complete continuity of care if transfer had been needed. I did not realize at the time what a rare gift this was. I’ve heard and seen horrible stories of abuse and neglect first-hand, both in hospitals and out. When a loss has happened at home, it’s true – there is knee-jerk, defiant defense of the midwives and shaming of loss parents, which makes me nauseous. I know from personal experience as a doula that some home birth midwives are dangerous. It is long past time to take a step back and talk about this. I know there is a healthy way to have BOTH mother-centered, empowering OOH birth that is also SAFE. To C.R. – I am so, so sorry for your loss. You are not to blame and I send all my love. I’m a homebirth midwife with two losses on my hands. A baby boy died in his mother’s womb a week after his due date. He was born at home a week later. A baby girl died soon after her breech birth–in my hands as I worked to resuscitate her. Each family asked afterward if I thought their babies would have lived had they birthed with doctors in the hospital. I had to tell them I thought it most likely, especially in regard to the breech baby. And we sat together in that a while and, over time, both families decided they didn’t regret their decisions, and then both families chose to birth the babies that followed at home with me. It’s been almost 4 years since my precious baby was stillborn at home. I was heavily involved in the homebirth community (in my country – not the US) for six years in the lead up to her birth. I raised funds for this particular group. I was one of the main on the ground organisers for their national festival – while I was pregnant with my baby who died. I met regularly with local members of the group. I counted many, many of these women and midwives as my friends. When my baby died (completely preventable, but that’s another story) the initial outpouring of support from the group was wonderful. I won’t deny how much it meant to me. There were meals, gifts, people came to her funeral, offers of company, etc, etc. And I was given space to share her story, as I understood it at the time. But then things started to change. I started to question the events around her birth and death. I started to question my midwife’s actions and decisions. And the cracks started to appear. I put my questioning to the group, as part of trying to process it all. And the support started to disappear. People stopped talking to me. I reached out for support, because I desperately needed it, and you ask your friends for support, right? But the more I questioned, and the more it became evident that my midwife had been negligent, the more the community closed against me. There was no overt nastiness, just…silence. Those I counted as friends might as well not have existed. One of them would rave on facebook about how great it would be to be a death doula, but in her one message to me, couldn’t even ask me how I was, or mention my dead daughter. Other “friends” went to the media about how the proposed hospital homebirth system at a local hospital was “too restrictive” – less than a year after they went to the funeral of a baby who died at what had clearly been a very unsafe homebirth. But no one spoke to me about it. When my midwife committed suicide after being faced with the possible legal implications of her negligence, a bunch of my “friends” went to her memorial service to commemorate how great she was, despite knowing of my grave concerns about her practice. When a homebirth rally was held in my city four months after my daughter’s death, “friends” from all over the country flooded to my city. I heard from exactly one of them. On the first anniversary of my daughter’s death, one of my “friends” messaged me to say that it was my fault that she never contacted me anymore. All I’d ever done was beg for my friends to be my friends, even just to ask me how I was going from time to time. The more I tried to talk, the fewer people there were to listen. It wasn’t even necessary for people to be nasty – they just had to not give me an audience, to shut me up. All those pledges of support really meant nothing once I began questioning things. I was inconvenient. I didn’t fit their narrative anymore. So they stopped engaging with my story, with my questions, and ultimately with me. That, combined with the obvious guilt and shame feelings that we loss mothers pile on ourselves, even when it was Not Our Fault, results in silence. Hiding away. The truth of our stories, the truth that only emerges when the fog begins to lift, is not told because there’s no one left to listen, except the hidden communities of other homebirth loss mammas. You dare to venture out on facebook and comment on something, and you get howled down and ridiculed by the voices of those desperate to defend homebirth and midwives at all costs. You worry about ending up in legal trouble if you mention your midwife’s name in public. You get hounded out of the local babyloss group that you are admin of, because malicious people start flooding it when you dare to say “too much” about your story. You thought it was a safe space. You are too scared to share your full story, that bit about your baby having been born at home, in public loss groups. You find out that a “friend” has been spouting on facebook, referring to your dead baby and your midwife, in favour of homebirth, even though you’d had a very clear conversation with her about your changing view on homebirth. But she probably thought you’d never find out what she was saying and so felt comfortable using your baby as an ideological football for something that you yourself no longer support. And being able to drop names makes her look more knowledgeable, I’m sure. The online homebirth community hides your story away in the hidden places of their forums, supposedly to protect your privacy, but with the double effect of most members, especially new members, never hearing the negative stories about homebirth, and being given the impression that homebirth deaths are much rarer than they actually are. You find out that the homebirth community actively tried to prevent you from hearing about another baby dying, or tried to prevent you hearing about your midwife’s suicide. You don’t start to realise just how many other homebirth deaths are occurring, that are being hidden from the homebirth community at large, until you are numbered among the families affected. You realise that they’ve all slunk away from public view, just like you feel you’re being forced to, and so you never even knew about them. And a lot of the time, you’re too busy just being crushed by your grief, grief that never ends, to have the energy to do anything about it. So your story just never gets heard. It’s been almost four years since my daughter was stillborn at home. And most of the homebirth community does not know what really happened, what really caused her death, because they were not willing to listen or to let me make it known. And I lost most of my community and my “friends” in the process, on top of losing my daughter. Thank you for this thoughtful and compassionate article. I am a perinatal/L&D Nurse of 26 years. Currently a nurse manager of a busy “inpatient” L&D Department where about 300 babies are born each month. I’m also the mother to six adults, five daughters. When my daughters started having children I encouraged them to find midwives who supported OOH births because my daughters are healthy young women with low risk factors. Hospitals are not the safest place for them to give birth. Women need OOH options which are safe and supported by the community. I continue to work in the hospital because women need this option as well and there is a great deal of improvement needed. Unfortunately loss is something which happens sometimes something was missed frequently it wouldn’t change regardless of your location. What a bizarrely irrelevant and insensitive comment, given the nature of the original post. Could you link the article you are referring to? I think this piece was well thought out, and I would like to put in in the context of the article it is responding to. Thank you. As a home birth CNM, I believe this topic dovetails with the difficult conversations and decisions we midwives must have/face in order to do our best to PREVENT a loss or harm by creating a hard stop for home birth and recommending either transfer to hospital or plan a hospital birth or cesarean instead of the dreamed of home birth. The woman and family also feel a loss in this instance even if mom and baby both arrive home physically healthy – they have lost their desired home birth or potentially vaginal birth without the opportunity to see if it could have been a reality. The midwife is potentially vilified for refusing to continue to support the home birth once she felt that it had become too risky. We have a duty to protect our licenses in order to be able to continue to provide our services to future clients. We are often caught between a rock and a hard place not knowing if a labor would need to ultimately transport or end up being a successful home birth. What is the original article? I would like to read it.